Approximate reading time: 15 min. 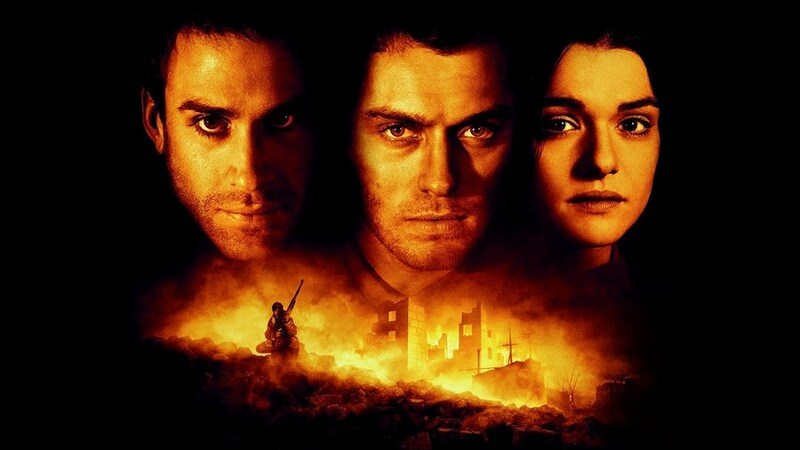 Review of the film Enemy at the Gates (2001) of the project What is good. There are few movies about WWII in the West. The most pompous, widespread and advertised is the “Enemy at the Gates” by French Oscar winner Jean-Jacques Annaud. This picture has been honored to open the 51st international Berlin Film Festival. So, the action in the film covers the period from 20th of September 1942 to 2nd of February 1943 and narrates about one of the most bloody and decisive battles of the world’s history – the battle of Stalingrad. The plot is tied to the sniper battle of Vasily Zaitsev and German super-ace Major Erwin König. Apart from this the plot shows relationships development in a love triangle Vasily Zaitsev – Komsomol volunteer Tania Chernova – commissar-propagandist Danilov. Altogether a rather Hollywood plot. We must give credit where it is due to the film’s creators – they lash out on the filming, some scenes are so epic and colossal that are breathtaking. Fireworkers, decorators, designers, costumers, stage directors – all worked with an excellent mark. A sound track to this film is also very impressive. The music corresponds to the picture so well. From the technical point of view the “Enemy at the Gates” is good. It is hard to fault questions of staginess and visual effects. The same can’t be said for a meaning component. The movie creators pretend for a historical truthfulness: a viewer’s attention is paid to the fact, that the film is based on real events; the narrations is leaded about real people – Zaitsev, Khrushchev, Koulikov, Danilov, Paulus; there are real dates of important battles being supplied. But don’t expect the historical correspondence. On the contrary, script writers have managed to distort and pervert facts so that the picture became offensive for nations of the former USSR. The film starts very dynamic, the audience is shown the unloading from the echelon of Soviet rifle division, forcing the Volga and an entry into combat near the railway station of Stalingrad. It appears that our unarmed soldiers, as a bunch of pricks, have been sent to the battle by furious NKVD, using wakeners, kicks-pokes, and in terrorem firing off and on from guns in the air or into cowardly soldiers. From bad to worse. It is shown the scene of unsuccessful attack on the railway station. Soviet soldiers are again being send to the battle by NKVD (it is appeared to be no commanders in the Red army) as a herd. They are given a one gun for a two (! ), and most of soldiers run over the top on entrenched positions of Germans, on tanks (!) with bare fists! What rubbish. No platoon leaders, no company commanders. Only commissars of NKVD with a machine-gun and a ride herd. Germans are shown properly, military dispositions are ideal. Germans swipe at soviet scared to pathologic fear horde from all guns, machine-guns, tanks… As a result, soviets turn back and run, where they have been cruelly shoot by barrier squad of NKVD, and under requiem music the audience is being thrown the idea, that NKVD killed far more their soldiers than Germans did! A similar situation of shooting by soviet soldiers their own people happens during the passage through the Volga: when feared by German planes having just arrived soviet soldiers jump into the river, they are being shot by their own commanders. This is the beginning of the movie. And this is a shameless lie. The most offensive that many viewers will perceive this as truth. In actual fact it was like that: 20.09.1942 Zaitsev arrived to Stalingrad as part of 276 rifle division of Colonel Nickolay Batuk. In the film our soldiers – are unblooded and young. In reality Siberian soldiers of 276 rifle division were experienced – under the guidance of Zhukov in august 1939 they crushed Japanese at the Khalkhyn Gol. And before departing to the Stalingrad front 276 rifle division successfully fought under Voronezh. And after arrival to Stalingrad this division had not suicidal stormed any railway stations: it was on the back foot on the Mamay kurgain, where successfully dealt with attacks of elite battalions of Wehrmacht. In reality everything had been conversely, than in the film! Maybe somewhere there has been one gun for a two, but not in Stalingrad. Both Germans and Russians were armed cap-a-pie. The scenarists are obviously sympathizing to Germans. It turned out to be that Germans darn near marched through Stalingrad, occasionally shooting at piles of corpses of Soviet soldiers. Had Germans walked at the speed of 4… 5 km/h, then left 300… 500 meters to the Volga they would have made for 5… 7 minutes. What in reality took them 7 months, and they did not make to the Volga at all. There is no won battel in the film, only defeats and run away of Soviet foot soldiers. Only Soviets snipers had won. By means of what Soviet soldiers won the Stalingrad battle is left off-screen. There is no hint of stamina and heroism of Soviet soldiers in the film! They are shown as browbeaten, cowardly, afraid, ignorant, uneducated cannon fodder, which Germans put in packs! (Editorial comment: heroic deeds of Soviets soldiers are still shown in the picture: soldier Volodya does not give up snipers’ positions to fascists, when gets caught. Sacha, a young Soviet boy, volunteers to act as a double agent by passing König false information about Vasily’s whereabouts, thus giving Vasily a chance to ambush the major. He pays his life for Vasily in the end. However, in scenes of mass attacks soviet soldiers take to flight). Only 7 Germans, apart from those, who died from snipers hands, have been shot in the movie. Hundreds of Russians have been killed on the contrary! Zaitsev writes a propaganda letter in the rear under the guidance of political instructor. According to the film Zaitsev is uneducated – he writes under orders after syllable, yet with mistakes, which commissar corrects straight away with diplomatic blames. Zaitsev blushes, embarrasses of his ignorance, he is ashamed – a beautiful member of Komsomol Tania Chernova is sitting nearby, patronizingly and coquettishly smiling to the main hero. The scene is nice, but offensive. Because, Zaitsev was not a heathen. Before the war he finished accountant courses, a military-economy school and worked as a chief of financial part of the Pacific Fleet. The script writers have been studying Zaitsev’s biography; indeed they knew that he was a simple shepherd from the Urals. By the way, there is a special accent on it in the film, probably, in order to show the contrast with German aristocrat Major König, Zaitsev’s opponent (Danilov: “Aristocrat from Bavaria against Ural shepherd – wolves’ disaster… this – is a class struggle”). Zaitsev’s German opponent is not near a hick. He is smart, educated, reads a book, shines shoes. The audience gets to understand, why Soviet soldiers fight at the principle of a horde, filling up the opponent with corpses. Pointedly that the script writers missed the fact, that not only the Soviet side was cruel. Germans also had penal companies and barrier troops. And they shot and hanged their deserters. For those, who doubt, we recommend to read the book of German battle-front veteran Wieder Joachim “Stalingrad tragedy”. The love story, if it would be somehow possible in those terrible conditions, is shown with a compulsory bed scene, shameless and explicit, happening at the presence of strangers. It is hard to believe in it. Also twice in the movie gleam kissing passionate snipers, whose roles are episode. Even the actors, playing Soviet people, have been picked with sickly faces (NKVD people from the penal company, the typist in the main office), there is a war correspondent, stealing products from the table, meanwhile nobody sees him, and there is a soldier, stealing valuable things from corpses of his dead comrades. The only one Soviet army captain in the film is shown obnoxiously to the limit – drunk, fat as a pig, stupid sun-downer, sniveling from the critics of his command. German army captain (Paulus) is shown in an entirely different light: he is extremely polite, cultural, judicious wise. When watching this film, one understands, that really in the West there are people (sponsors of this film), who hate Russians with fierce hatred, considering them not fully human people. And this “laying” is not a coincidence already back then. But the most contrast in the film – is the comparison of Zaitsev and König. 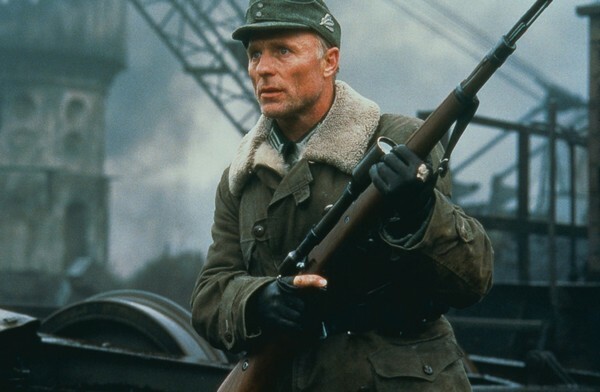 Even the fact that the role of German sniper got brilliant and talented Ed Harris, and the Soviet – Jude Law, tells much. Ed Harris is quite good in this film. He really got into a role of a German sniper. Not only his hunting glance, but the mimic, movements, speech – everything is played at the highest level. And now let’s look at the Soviet sniper: he is cowardly, whining, blowzy, unwashed face, dirty torn quilted jacket. Throughout all snipers’ opposition Zaitsev according to the movie is trying to prove everybody, that he can’t defeat the German. Typical Zaitsev’s quotations: “He is the best”, “I can’t defeat him”, “He will kill me, and not I will kill him”. In the end he, finally, finds moral powers in himself to kill his opponent, after Sasha’s death for him: “I will kill him… and his gun will give to you”. We don’t know how it was in reality. But if you come to Moscow and visit the museum of Armed Forces, you will see not only the sniper’s gun of Major König, but 4 more guns of German ace snipers, whom Zaitsev defeated in Stalingrad. In the film, the victory of Zaitsev over König looks not convincing; it is unclear, what his merit is in. Zaitsev had been helped to defraud König; all he needed to do – is to shoot at the Major at a distance of several steps, when König left his refuge. The film’s script writers explicitly lie that König was the best. No, he just was one of the five best snipers, whom the Soviet soldier had properly defeated. Russians regularly appear in the movie with alcohol and tobacco. Scenes of smoking are being savoured and shown close up. Everybody smokes, including women, even the main heroine. Major König also savoury smokes his expensive cigarettes. Inserted an inappropriate bedroom scene, lowering the relationships of the main hero and his beloved one into the level of instincts (the heroes make “love” at the presence of other soldiers). Corresponds to the war theme of the film and age limit 16+. The movie presents itself an example of anti-Soviet propaganda, picturing the Red Army soldiers as ill-mannered and dirty ragamuffins, who had been whining all the time, poisoned themselves with alcohol, could only fight at the barrels of blocking detachments and had been winning fascists by simply covering them with corpses. Representatives of Soviet power are shown solely in a repellent light: by their appearance and manners. The mechanism of implementing these viewpoints in the heads of the audience is standard: entertaining filming and movie starts attract the audiences’ attention, emotional scenes make one’s mind sensitive and open, and in these gates the needed information is being inflowed. The message of films “Why Him?” and “The Internship”: Jump the shark, and meet the success!